No sir, it is FS9, Tim Conrad's T-28C Trojan. 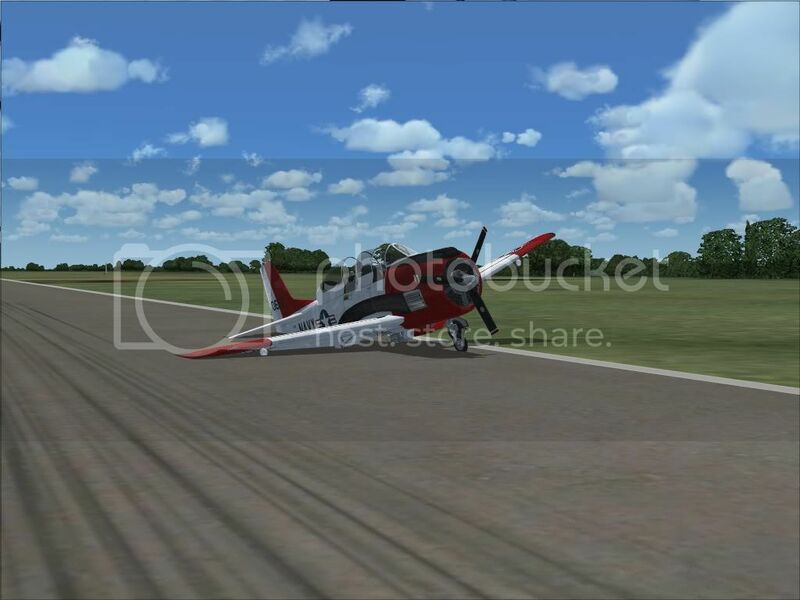 I doubt it will work in FSX, seems most prop planes designed for FS9 will not work properly in FSX. Blaming the rig for the obvious lack of skills? Did you bust off the starboard gear, or did it just not deploy? Broke it by landing too hard and too fast. FS does have the ability to cause random systems failures. I remember one flight in a DC-3 that ended with the starboard engine going "bang" while on final. It was a frantic few seconds to cut the fuel, cut the mixture, feather the prop, regain control and finish landing. That engine died at the point on the approach where I had no choice but to land, one way or the other. That's the typical scenario of "Good weather, bad landing". Good thing I have not yet deleted that image! Ahhhhh, the joy of being new to a board. The innocence, the exuberance, the resurrecting of ancient threads. It's all right iidesu, thanks for the comment. For the record, my crashes are quite infrequent these days. My last crash seems to have been due to my controllers locking up. Once in a while FSX goes stupid and stops recognizing my controllers, the last time it happened I was about 10 seconds from touching down. My aircraft started rolling to port and no amount of stick, rudder or throttle altered my new pathway to to terra firma. Watching the replay in external view I saw the ailerons go into full deflection, something I had not done, but is typical of FSX when it loses my controllers. Fortunately, being so close to touchdown, it wasn't a fatal crash.